We won't even pretend to know how advanced, or how futuristic the computer screens and interactive touch screen scanning device was that greeted M and 007 at Mi6. Suffice it to say, if you have ever tried to get a PC out of UK Civil Service budgets you now know it has all been spent by the British Secret Service. Touch screen technology has existed in its crudest of forms as early as 1972, and the tech has moved apace to the point where many of us now have personal communication devices featuring multi-touch technology. Mitsubishi's Diamond Touch, multi-touch, multi-user system became available commercially in 2008, so M's assistant Tanner is sure to have been one of the first in the queue at the PC store, with his boss's expenses account cheque book. To be fair, no big deal is made of the table top wizardry, movie goers had already seen something similar way back in 2002 in Tom Cruise's Minority Report. We thought it important to include it though because we had been wondering why the prices of home PCs had crashed at the stores below. 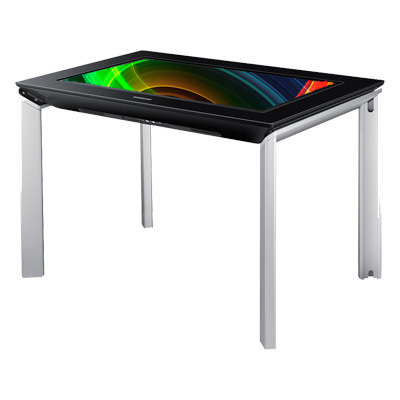 A good example of the sort of similar technology seen above is this Samsung 40" Full HD 1080p multi-touch device for Microsoft Surface, which takes computing to a new level. It features, Windows 7, an AMD Athlon X2 2.9 GHz dual-core processor, and AMD Radion HD 6570M. You should be able to pick one up for around £6,000. you can compare prices at the store below.